To get to either of these from Blanding or Hanksville, Utah take state highway 276 off state highway 95. If you are coming south from Hanksville, state highway 276 will take you to Bullfrog . If you are going north from Blanding, state highway 276 will take you to Hall’s Crossing . The John Atlantic Burr and Charles Hall Ferries operate between Bullfrog and Hall’s Crossing and saves drivers 130 miles they would have to drive by staying on state highway 95. The ferry, which accommodates cars, motorhomes and buses, operates year-round with reduced service hours in winter. There are no reservations for the ferry. It is strictly a first come first served. If you are planning on using the ferry, please call (435) 684-3088 for current schedule and fare information. 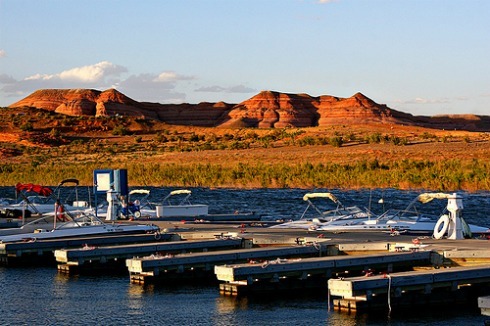 “…our 2nd largest marina with a staff of 225 + employees, 18 departments and 100,000 visitors at peak season…a smaller model of the thriving and fast paced industry familiar to Wahweap Marina." It is unclear just how the name Bullfrog was derived. Some say it was named after a creek in the area, which is now under the water of Lake Powell. Others say it was named for a rock formation found in the Henry Mountains which is just north of the marina. Just out of curiosity, I did a Google search for marinas named Bullfrog and came up with two with the same spelling and one where Bull Frog was two separate words. The NPS, also, has a nice Visitor’s Center with several exhibits on the geology and history of the area. 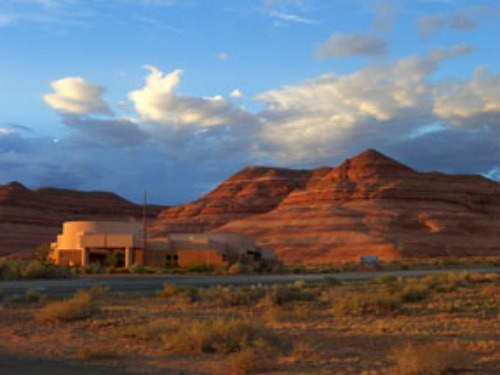 They sell books, videos, maps and posters of Lake Powell and area. If you are visiting Bullfrog Marina, this should be a first stop for information on the marina and the area. • From 8:00 AM to 5:00 PM April through October. • Closed November through February. In the same building as the Visitor’s Center is a medical clinic, staffed by a Physician’s Assistant. The clinic is open May through September. Bullfrog is open year round.